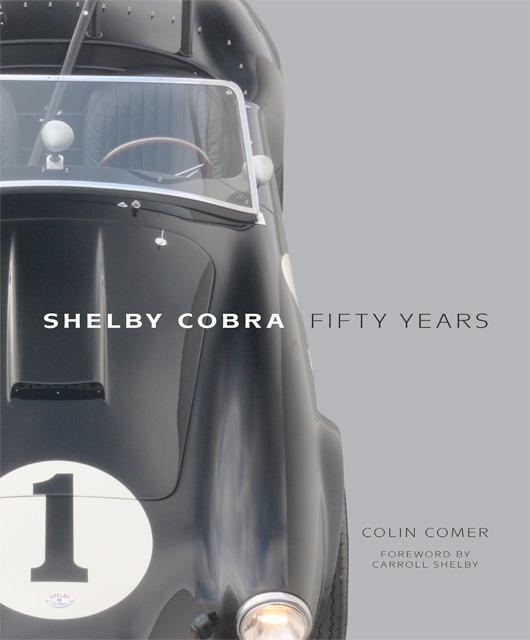 With John Bentley doing the ghostwriting, Carroll Shelby wrote his book The Cobra Story in 1965, at a point when the Cobra story wasn’t done yet — not by a long shot. So you could say he began building the legend of Shelby American even before he was done with the first phase of the Cobra and, remarkably, he is still building them 50 years later! There have been many books since, most concentrating on the car and few on the man himself. That’s not a flaw, though, as most people who buy a book like this yearn for a Cobra and even though they may only get as far as owning or building a replica, they like to be able to know every nut and bolt of the real Cobras, and throw around phrases like “side oiler” and “Monza quick-fill.” You can do that if you read this book, and that’s the fun of being a car enthusiast for a particular marque, becoming an expert on your favorite car. Colin Comer has written a couple of previous books on Cobras and Shelbys so he is highly qualified to do this one and he has a really good helpmate in his wife, who diligently searched far and wide for pictures. It is impossible to put a new book on Cobras together without re-using some of the same old photos used elsewhere but the fact that they found a few new ones not seen by this historian – who has written three books on Shelby’s cars – shows they went further and dug deeper. And the more valuable the original Cobras get the more we enthusiasts want to see every single variation of Cobras just as they were run at Sebring, Daytona, Le Mans, etc. There’s still one small hole in his coverage—no rally shots. Yes, Cobras were used in rallies! I would like to see one fitted out with a full set of road lamps. Yet it’s the same old racetrack shots. The color reproduction is very good — the paper chosen is top notch. So for example Jeff Burgy’s pictures of Ford’s experimental Cobra designs are brilliantly reproduced. The author has purposeful useful captions, only falling down occasionally in the fact-checking, such as on pg. 22 again perpetuating the myth that Shelby was the one responsible for redesigning the A.C. car to become the 260 Cobra. Comer needs to buy some books on A.C. history and then he’d know A.C. made 27 Ford Zephyr-powered A.C. roadsters with the same nose as the 260 Cobra before Shelby built his first Cobra. Comer perpetuates another myth when he says Ferrari tried to register the 250LM as a GT car because it was an “evolution of type” but if he bought some Ferrari books he’d know the 250LM was refused homologation as a production GT car for the same reason as the 427 Cobra was refused homologation as a GT car – both firms failed to build the minimum number of 100 cars. Another fact where I take exception is Comer saying Pete Brock was assigned to do a 427 Cobra coupe. It is more like Pete Brock intensely lobbied to design a 427 coupe and Shelby only reluctantly agreed (which is why he assigned it to a loser coachbuilder in the UK). And the scandal of the “rediscovered” big block chassis in the ‘80s is only touched on briefly, Comer saying nine were built, but Comer never actually says when the chassis were laid down. I wonder if Shelby would have withheld writing the forward if more would have been spent on that subject? But back to the pictures, where the book goes beyond any Cobra book published so far, both in historical pictures and luscious color of restored cars. Once or twice Comer includes a fuzzy picture. That’s a tough choice – where the subject is interesting (such as Harley Cluxton having three Daytona coupes at once) but I ask why devote a half page in color to a fuzzy picture? I’d rather have a good old black and white historical shot with great accuracy in reproduction. A potentially valuable contribution to Cobra lore is a section of color pictures of original memorabilia such as the Cobra jackets and even Cobra jewelry. Those of us who can’t afford the cars can at least afford the memorabilia. The best contribution, though, of this book to Cobra lore is the pictures of the cars as raced. As original Cobras pass the $500,000, more owners will want to restore cars correctly and then there’s that legion of replica owners who want to make their car a “period correct “ replica. Colin Comer has a car business where he sells original Cobras and Shelbys, so he knows of what he writes. I have to congratulate the editors for going the extra mile to budget for a pretty book that is also a 99% accurate reference book. And though the cover price is $40, it’s amazing that Amazon.com can sell it for $26.40 so let me say this: if you love Cobras and the Shelby American legend, you owe it to yourself to skip five trips to Starbucks for coffee and a Danish and buy this book. The author Wallace Wyss has written three books on Shelby & Cobras. His latest book is the action-thriller Ferrari Hunters, available from www.albaco.com.